Knit from the ruffle up to the base of the neck, this shawl has a gorgeous, flame stitch gusset panel and a flirty, romantic ruffle along the entire lower edge. The pattern is written with easy, step-by-step instructions. While we don’t believe in difficulty labels (anything can be accomplished if you just give it a try! 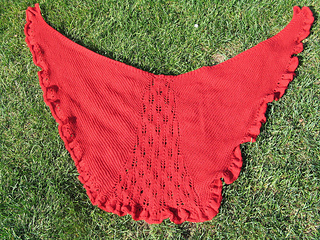 ), the center lace panel and bordered ruffle may require intermediate-level knitting skills. There is generous shoulder shaping that helps keep the shawl securely on one’s shoulders. Finished size: 70” x 30”. Requirements: 900 yards of dk weight yarn and size US10.5 (6.5mm) circular needles.